On May 15, 2015, Chinese government announced that by coming September it would complete its first phase of the new plan. The new plan allows local government to swap their loans up to $160 billion for lower interest slow maturing government bonds. This would allow a stable repayment method for the localities and lower local government debt-servicing costs, thereby freeing tens of billions of Yuan in liquidity. The current local government debt is estimated to be around $3 trillion. The Chinese policymakers ordered banks to keep lending to local government projects under construction. “This will help meet reasonable funding demand of the real economy, as well as effectively prevent and resolve fiscal and financial risk,” the regulators said in the document. The regulators feel that projects involving cheap housing, urban subways, agriculture and irrigation should be specially supported. The whole idea of allowing the local governments to issue their own bonds is not completely to China. In 2008, a decision was made to bind the local government finances to the state-owned banking system through LGFVs (Local Government Financing Vehicles). The central government had disallowed localities to issue their own debt and created legal framework for them to withdraw from state-owned banks. This way the central government had full control over all that happened in the markets. But in 2010, the framework started to crumble as China eased the lending to LGFVs. But this move could slow the economy of China, as some LGFC projects remain abandoned. Large number of projects in China is facing bankruptcy, which could be a serious problem for China’s financial system. Many critics also argue that even though local government debt problem has a plan, it’s the corporate debt that remains abandoned and problematic. 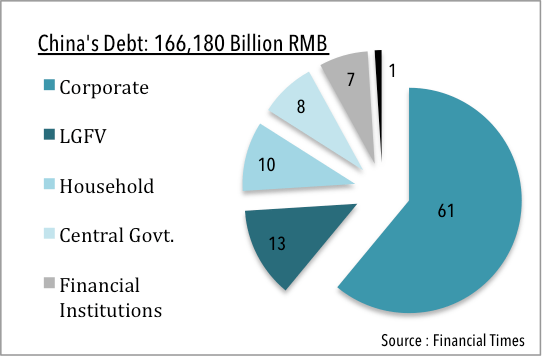 Currently, corporate debt in China’s total outstanding debt is approximately 61% (more than $16 trillion) amounting to 180% of country’s GDP. With corporate debt around four times the size of local debt, it becomes a bigger issue that needs urgent attention from Chinese regulators. However, the debt-swap program has not shown much improvement as of now but again it is too early to tell. China faces another major issue: slump in property prices. According to a recent article in The New York Times, many economists estimate that ‘real estate and related industries account for more than 20 percent of China’s gross domestic product.’ China currently has a huge oversupply of unsold homes usually in the outskirts of major cities. For China, real estate sector plays a major role in boosting its economy. But a slowdown in the economy, especially in the first quarter of this year has raised some concerns. The slowdown of this sector can adversely affect construction companies, steel and cement plants, banks and property brokerages. China’s real estate, credit and stock market bubbles have produced ghost towns, backlog of unsold homes and unleased shops. While the financial system goes through structural reforms, it still seems that the China’s government is taking some real risks. However, many argue that permitting markets to direct the flow of talents, trade, investment, and capital could be a very critical part of future growth in China. The good news is that China’s leaders are not shying away from their past mistakes and are trying to take corrective measures. China’s real estate developers are not starting any new projects, which is seemingly evident from the sharp decline of 31 percent in land purchases by developers. China’s leaders now aim to transform China into one of the world’s leading industrial powers by 2045 and for this, a new business model will be designed. By doing this, it aims to reduce and eventually overcome the country’s dependence on cheap manufacturing and instead focus on advanced industrial goods for markets. Not only this, China has for long been building knowledge-based economy, driven purely by innovation and domestic consumption. A recent article in MarketWatch points out that even though China’s specific goals have seen a shift, its policymakers have adhered to this experimental approach. And this seems true. The risk taken by China’s policymakers by applying new approach has helped in China’s growth even though with some considerable losses. However, with its new transformational policies and anti-corruption campaigns, China seems to have both the experience and the modern approach to overcome any slow growth it faces.